Dallas, TX - "Railfan Primer"
Please click any photo on this page to see a larger image. Coming to Dallas? I offer this page as a sort of "Railfan Primer" for out-of-town visitors who want to watch and/or photograph trains in the downtown area. 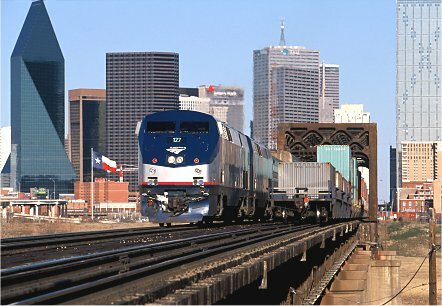 Rail activity in downtown Dallas includes DART light rail trains, TRE commuter trains, Amtrak passenger trains, and freight trains of Union Pacific, BNSF, and Dallas Garland & Northeastern (DGNO). Dallas' McKinney Avenue Trolley also operates in the downtown area. The area around Dallas Union Station provides excellent vantage points for viewing DART, TRE, Amtrak, UP, BNSF, and DGNO (in short, everything except for the McKinney Avenue Trolley), and is an ideal place to begin your visit. The station platforms put you right in the middle of the action: DART uses the two tracks closest to the station, TRE uses the next track over, and the outermost platform serves the Amtrak trains. And you can watch the freight trains of BNSF, UP, and shortline DGNO on the two tracks farthest from the station. With our current security situation, it might be a good idea to check in with DART police, located inside Dallas Union Station, prior to taking photographs from the station platforms. The three photographs below were taken from the station platforms at Dallas Union Station. Finding a good place to park your vehicle in downtown Dallas can be a little tricky. The city allows parallel parking (don't forget to bring some quarters to feed the parking meters) on several downtown streets ... IF you're lucky enough to find a spot. If not, there are several pay parking lots within a three or four block radius of Union Station. A short distance south of Dallas Union Station, the Houston Street Viaduct provides an overhead view of all of the above action -- except for the TRE commuter trains, which normally use only the north portion of Dallas Union Station. Walking distance from the station to the viaduct is no more than about 8 to 10 minutes. Look for the stairway leading from the pay parking lot (located at "ground level" east of the tracks, and south of Union Station) up to the sidewalk on the bridge. The photos below were taken from the Houston Street Viaduct. The two photos below were taken from ground level near Dallas Union Station -- across the tracks from the platforms -- looking south toward the Houston St. viaduct (visible in the background). These photos were taken in 2000 and due to current security issues, probably should not be attempted today without prior authorization from the Union Pacific Railroad, which owns the tracks and right of way at this location. West of downtown, great views of the Union Pacific Dallas Subdivision are available from the levee on the west side of the Trinity River. Take Commerce Street west from downtown, exit Beckley, then go north one block to the tracks. After you cross under the tracks, park along the levee and climb up to enjoy the view. On the railroad, the location is known as CP T219. Traffic here includes UP intermodal, unit rock, mixed freight, occasional DGNO transfers, and Amtrak's daily Texas Eagle trains. If you're lucky, you might catch a BNSF reroute as well. Depending on how long you hang around Dallas Union Station, you'll probably see many more DART light rail trains than anything else. DART trains run on approximately 5 minute headways during rush hours, and 10 minutes during non-rush hours. (See schedule information at www.dart.org ) Likewise, TRE schedules are busiest during rush hours, but during non-rush hours, trains arrive and depart Union Station roughly once an hour. (See schedule information at www.trinityrailwayexpress.org ) DART trains run seven days a week, but TRE operates Monday through Saturday only. As for freight traffic, UP is definitely the dominant freight hauler in the downtown area. Manifest freights, intermodal trains, and unit rock trains make up most of the traffic. As they pass Union Station, UP's trains are operating on the railroad's Dallas Subdivision, the double track former T&P line between Fort Worth and Dallas. West of downtown Dallas, the tracks pass through Browder Yard, then Grand Prairie and Arlington before reaching Fort Worth. Southeast of Dallas Union Station, the tracks pass the former site of the Tower 19 interlocking (where the T&P crossed the former Santa Fe Dallas Subdivision) and then continue south to Belt Jct, where the lines split, allowing some trains to head to the former SP Miller Yard in south Dallas, and others to continue east on the former T&P to Mesquite, Mineola, Longview, and points east. BNSF trains normally appear only during non-rush hours for commuter traffic, since most of them use the TRE line northwest of downtown Dallas. Others sometimes operate via the UP Dallas Sub between Dallas and Fort Worth. Traffic includes manifest freights and unit rock trains, and occasional coal trains to and from power plants located south of Corsicana. Once in a great while, an intermodal train may appear, destined to a connection with KCS in east Dallas. BNSF trains travel over UP Dallas Sub trackage between JFK Jct and Forest Avenue, located two miles south of Dallas Union Station. At Forest Avenue, BNSF trains enter the former Katy, now owned by BNSF, to head toward Waxahachie. Shortline Dallas Garland & Northeastern switches most of the industrial spurs north and west of downtown Dallas, and their trains pass through the Dallas terminal area at various times throughout the day, en route to and from the different spurs and interchange runs to various UP yards. AAR 20 (160.410 MHz) - UP Dallas West Dispatcher (east of CP T916). AAR 78 (161.280 MHz) - UP Terminal Train Dispatcher (west of CP T916). AAR 82 (161.340 MHz) - BNSF Tulsa South / DFW Sub Dispatcher. AAR 83 (161.355 MHz) - TRE. © 2000 - 2004 by Wes Carr. All rights reserved.